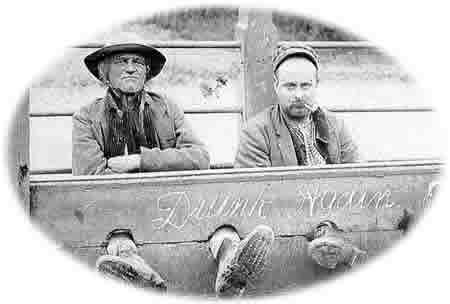 The village Stocks, pictured here with the motto “Drunk Again”, were used to punish minor offences. They stood by the Court House where local justice was meted out since the 1400s. 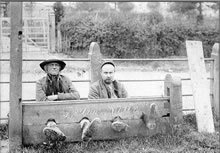 As well as serving to restrain and humiliate offenders, the Stocks may possibly have served as a whipping post. Note the tall vertical post on the left of the photograph that could be used for this purpose. The stocks were last used in the 1860s. There is an engraving of the Court House, dated 1882, where the stocks can be dimly seen stored inside. In 1882 they were removed from their original position by the lord of the manor, Mr E Hussey, who had them repositioned to St Michael’s and All Angels Churchyard. They can be seen in this picture inside the church gates with Church Hill behind. The photograph was taken with 2 local men posing as miscreants for a joke. The Stocks now stand outside the Church to the west of the entrance porch. They are no longer in use!